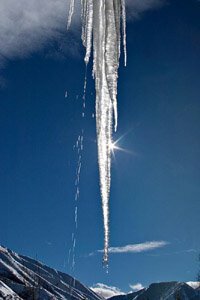 apart from beings, no Buddha." 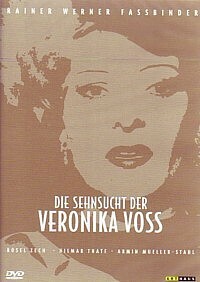 Saw "Veronika Voss" by Fassbinder. The film offers two themes: the dichotomous "Jeckyll And Hyde" metaphor and the idea of life imitating art. This realistic post-war Germany piece is stunning. Though filmed in 1982, the film's setting and cinematography is authentic to the period, believeable in its stark representation of Germany's identity crisis, post-Nazi era. It is as if Veronika herself, an aging film star, a Monroe-equivalent in her heyday, is Germany, struggling to come out from under an oppressive regime. In this case, the propaganda is morphine, and the death of old Germany and the emergence of a new one have a battle via Veronika herself--it's a conflict between her ties to the past/delusions of grandeur and her present, drugged and controlled state by her puppetmaster, a Nazi-esque neurologist, Dr. Marianne Katz. There was a quasi-lesbian theme between Dr. Katz and Veronika, in fact, even a menage: Katz, Voss, and a reporter's girlfriend (a young innocent) all of them indirectly connected through the same man in one capacity or another. There is a pervading theme: the characters want commonality/simplicity to set them free, yet find no solace in being the controlled or controllers. It is the young woman in this trio who becomes the victim in this battle of nationalism, dying for an unknown German future.